Why? Because who would be stupid enough to get up in front of a bunch of kids who don’t want to hear a speaker… and try to speak to them? I’ve been speaking to teenagers for 25 years. People actually hire me to do it. 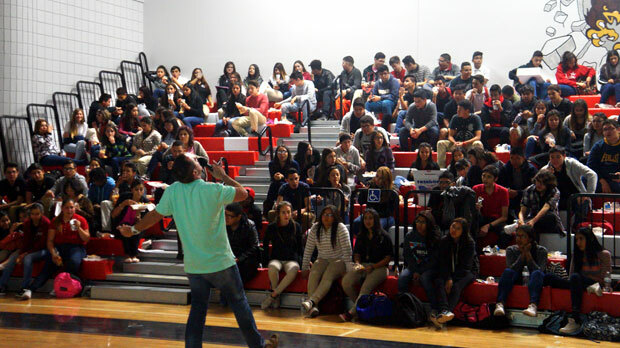 I probably spoke to about 5,000 teenagers last year alone (and I speak to far more parents and leaders than teens). And do you know what keeps me going more than anything else? I know I’m nothing without God’s help. We don’t got this. He does. And He let’s us be a small part of the process. The second you realize that, you’re one step closer. So bathe this whole process in prayer. Stories work. In fact, when I first realized this, I couldn’t believe how powerful Bible stories were. Try it. You’ll be shocked. Stories captivate kids. In fact, the biggest trick is practicing the sentences you have to say between stories so kids don’t tune out in those few seconds. Guess what? This works for adults too. Some of the best speakers are master storytellers. Humor is powerful. Some of us are funnier than others, but all of us can make fun of ourselves. Last week I listened to an Andy Stanley sermon online. If you don’t know Andy, he’s truly one of the most amazing Christian communicators of this century. The guy is a bright light helping people easily understand God’s word and readily apply it to their lives. Phenomenal! Anyway… in his sermon he began telling a story about himself going to one of his kid’s sports games. This humorous anecdote wasn’t just funny, it helped him connect with his audience The story painted him as normal and imperfect… just like me. The story made me laugh at him, mankind, and myself. Don’t be afraid to give examples from you own life. Pretend you’re in a small group studying a passage of scripture and someone asks you, “Share a time when you learned this… the hard way?” Typically you can think of something. Humor breaks down walls, and vulnerable personal stories (not inappropriate, just transparently human) help people relate to what you’re communicating. How Many Minutes Will Kids Actually Listen?